Our grant support to the Seattle Youth Garden Works Leadership Project will directly fund the stipends for five experienced youth leaders who will be mentors to high risk youth who have struggled with poverty, abuse and neglect. The primary goal of this project is to make a positive impact in the lives of these young individuals and provide them with a sense of belonging as well as lead them to employment opportunities. 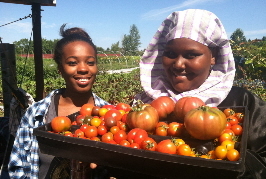 The Seattle Youth Garden Works project is a year-round training, mentorship and employment program in which a crew of teens works on a farm site at the Urban Horticulture Center of the University of Washington. Here the youth learn time management, teambuilding, leadership development, nutrition and ecology. They also learn fundamentals that are vital to the emerging food industry, such as harvesting, packing and marketing produce. Twice a week the crew harvests and packs produce to sell at local farmers markets. The Not Yet Foundation shares Seattle Tilth’s desire to provide a welcoming and inspiring environment where there is opportunity for at-risk youth to have a more productive and meaningful future.